Something is shaking the southwest and it's been baffling southern Arizona residents for years. The latest struck yesterday, Tuesday, Feb 5, at 8:39 a.m. I felt it myself on the northwest side of town not far from Ina and I-10. I posted it on Facebook and the responses were immediate. Faye DeHoff wrote, "first it was a major rattle...like a huge truck about to crash into my home...then the boom..that shook my windows...I was sure some of them were broken but they didn't...my dog jumped up! I'm at River and Campbell." Ray C. Merrill wrote, "Oracle and Roger, it was shaking pretty good, and long enough for me to watch the blinds dance around, then get up and walk to the doorway, and it was still shaking." There was a similar sensation last week on Thursday, Jan 31 at 8:51 a.m. The same phenomenon; a rumble causing homes to shake and windows to rattle. I felt this one too on the northwest side and once again, so did so many others on Facebook all across Tucson and surrounding areas. I checked with the three closest military installations. Davis-Monthan Air Force Base reported no sonic booms and neither did the 162nd Fighter Wing. Sean Clements from Luke Air Force Base's public affairs unit confirmed two sonic booms near Sells, Arizona, about 60 miles southwest of Tucson. Until he gave the times. The first happened at 9:36 a.m. and the second at 10:14 a.m. The incident so many reported feeling and hearing happened at 8:51 a.m. The times are off by more than a half-hour. Earthquakes might be more common you might think in Arizona. Looking at the U.S. Geological Survey earthquake detector, there were no quakes at these particular times eliminating that possibility. I checked with the Department of Geosciences at the University of Arizona regarding the January 31st incident. 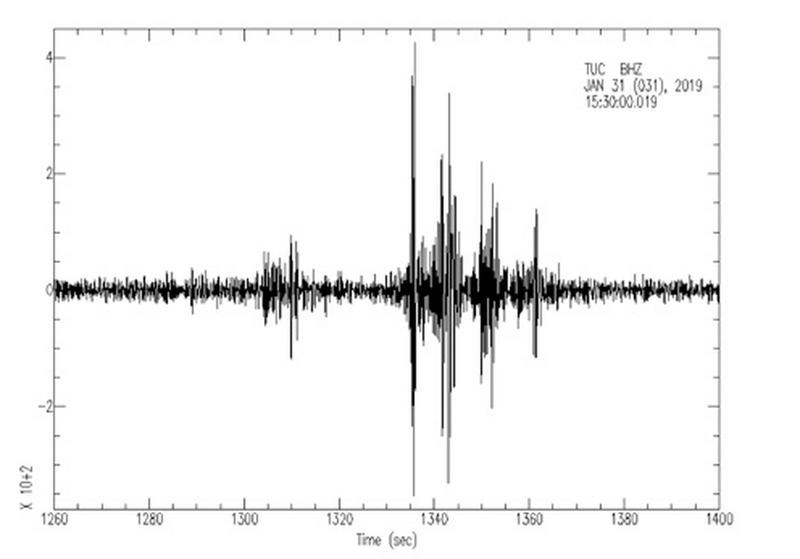 Eric Kiser, an assistant professor, noticed readings on the measuring machine, "there is a high-frequency signal on the Tucson seismometer between 8:51 a.m. and 8:52 a.m. today, but the signal looks quite a bit different than what we observed when the widespread tremors were felt about a year ago. In particular, last year's signal lasted a few seconds, whereas the signal from today lasts 40 to 60 seconds." Assistant professor Kiser provided information regarding another incident that occurred on Nov. 28, 2017, saying, "I looked through the Tucson station seismic data this morning, and there definitely is an event that shows up around 8:11-8:12 p.m. The seismology group looked at the waveforms today, but it is difficult to determine what the source is, using one seismic station. Generally, we would expect a sonic boom to not be as impulsive as this signal. A mine blast could be the source, but I would be surprised if they were blasting that late." Mining is big business in southern Arizona and blasting is very common so I spoke with Debbie McMorrow at ASARCO mining which owns and operates several mines around Tucson. She says ASARCO doesn't usually conduct blasting in the mornings and certainly did not conduct any today or last week during the times' people felt the shaking. CalPortland also conducts blasting operations but an employee told me today the company has not done any blasting in the Tucson area since January 29. Through the process of elimination for these three incidents, it can be concluded that these booms/rumblings were not caused by a sonic boom, earthquake, or mine blasting operations. I heard it and the sound was almost a minute...that is long. What I've always imagined a nuclear blast would sound like, without the explosion. These "booms" have been happening for many years globally. Reports of booms were in news during that last fake polar vortex in the U.S. and said to be frost quakes. About three years ago SWFL had one that I felt and heard, it was never explained. Back then I thought they were from methane explosions caused by global warming. Still that is probable and is one source confirmed by giant holes left behind after the explosion. Sink holes also have reports attached by homeowners hearing a boom right before the earth gave way to the sink hole. FL has a lot of sink hole issues! But now I have learned of another source that probably is behind these booms. Technology. Do people realize what it takes to power our devises I wonder? High power frequencies. This post seems in line with that as it says, "there is a high frequency signal on the Tuscon seismometer between 8:51 & 8:52." (Here I go again...) Geoengineering uses these high powered frequency signals, but so does the 4G technology and the upgrade already underway for 5G is 10,000 times more powerful! My bet, due to this signal at the same time as people felt the boom shake, is it is one of these technologies that caused it. We ate literally frying Earths atmosphere now and this techno screen burning to the atmosphere is much worse then the carbon burn! The use microwave beams of energy that shoot back and forth from satellites to the signal towers on the ground to your devises and back up again, all day long, every single day. The only hoax I see with regards to GW is this covered up and carbons being kept highlighted as the main source feeder for the warming. Now, I am not saying carbons are not an issue, they are, but this techno burn is radiation! Radiation is extreme heat. Adding it to the mix is a literal witches brew to put those final nails in our collective coffins. From the continuous rocket launches to get these evil satellites in to orbit, to the cell towers on the ground we are exposing all life to serious radiation now on top of all else and this is in no way progress towards any resolve for our overheating planet!!! Geoengineering is not just for weather control. It is also incorporated with our technologies that are turning our atmosphere in to a literal antenna! Microwave beams, think microwave oven! Same thing. These are all reasons I firmly believe the scientific researchers who are putting out near term collapse warnings. Earth is reacting to all this BS man does to her and since we do not let up on her she is going to stop us soon. Any boycott of techno products at this point would help us. When 5G is finally fully implemented is when we go down. Timelines for that also match predictions of collapse. 5G requires a cell box emitting radiation every 500 ft! On every urban street. We will be toast! Say no to 5G. They will never admit any of this nor will they stop it, so the only option that leaves us folks with is don't buy it. If profits slack bankruptcy could follow and these telecom companies will be forced down with their microwave burns. Its a chance we should take. The booms, methane explosions and or geoengineering technologies. Nothing else is capable of doing it.